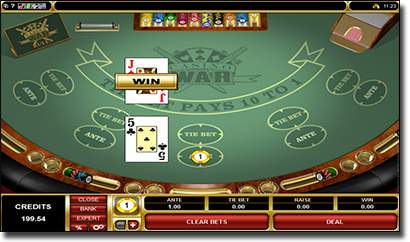 Casino War is a card game based on the classic game War which you may remember playing as a child. The basis of the game is to be the player who receives the highest value card and therefore the outcome is based entirely on luck. While this game can often be found in land based casinos (also sometimes called Trumps, Battle Royale or Rumble), software developers have expanded it into an online casino game which can be played for real money bets at a range of Internet gambling venues. While it may not keep the hardened poker or blackjack players completely absorbed, Casino War is highly suited to newbies as it’s known as the most easy to understand card game and there’s basically no skill or strategy required to play. Casino War is one of the only casino card games where the odds of the player beating the dealer are always 50/50, making it a great starting point for new punters to slowly try and increase their bankroll. This article will take you through the very basic rules of Casino War, some of the minor strategies to employ and where you can play Casino War online for real money wagers. These casinos are each powered by Microgaming and only offer Casino Wars to players accessing the downloadable casino software. If you don’t have the downloaded suite from any of these venues, downloads are free and only take a couple of minutes, with sites using a minimum of 128 Bit SSL security encryption to ensure user protection at all times. Casino War is played with six decks of standard 52 deck playing cards excluding Jokers. The value of the cards ranks in ascending order starting with two as the lowest, increasing in value through to 10, followed by Jack, Queen, King and Ace as the highest (the same ranking system as poker). Winnings pay one to one, therefore a $10 bet results in a $20 win. In the event of a tie (both player and dealer receive a card of equal value) the player has the option to either forfeit their bet to receive half of their wager back, or to “go to war.” Choosing to go to war requires the player to double their initial wager. The dealer will then burn (discard) the next three cards in the deck and deal another face down card to themselves and the player. If the player wins the war, they receive a payout based on their tie wager only, but if the dealer wins the war the player loses all bets. Some casinos also offer the bonus option of placing an additional tie bet when the first wager on the game is placed. This means you are betting that the first two cards dealt will result in a tie. Winning a tie bet is the most lucrative wager available in Casino Wars, with a payout of 10 to one. Don’t surrender – in the event of a tie during the first deal, never surrender your bet. It may sound a little bizarre, but mathematically speaking, the house edge actually decreases upon going to a war round. Also, some Casino War games offer a bonus payout for a tie on a second deal, so while it may be a risk to go to war, winnings will really payoff. Don’t fall for the tie bet – placing a wager on a tie in the initial deal definitely has an attractive payout (10 to one) but naturally, the payout is so high because the odds of winning are so low. A tie bet has an astronomical house edge of around 18-35%, so unless you’re playing with a hefty bankroll and can afford to take this risk, we suggest newbies and smaller wager players avoid the temptation of the tie bet.